Just because you need to lose some extra weight certainly does not mean that you need to ditch all of your favorite foods. In fact, experts recommend finding a healthy balance when you are dieting so that you don’t feel totally deprived of the foods and beverages that bring you the most satisfaction. 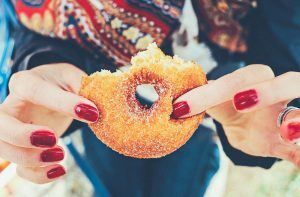 Continue reading to learn more about how you can lose weight while still enjoying your favorite foods. Some diets restrict entire food groups, while other weight-loss nutrition guides restrict specific foods that might be your favorites. But whenever you need to follow a diet that totally eliminates your preferred foods, it will be that much harder to stick with the plan and shed those excess pounds. So rather than depriving yourself, follow a diet like the Zone Diet instead. With this program, you do not need to eliminate any foods from your meal plans; instead, you just focus on eating the right proportion of nutrients at every meal. The goal is to consume around 1,200 calories per day if you are a woman, or 1,500 calories per day if you are a man. Then make sure that every meal contains roughly 30% fat, 30% protein, and 40% fat, along with low-fat protein and plenty of healthy fats. If you are craving fried foods while you are dieting, it really is best to avoid giving in. But there is a healthier way to enjoy the same flavors. Just take your favorite foods that you would typically deep fry, such as zucchini or onion rings, coat them in light breading, spray a bit of oil on a baking sheet, and bake until they are crispy. Baked versions of your favorite treats are much healthier and lower in the calorie department. Another food that you do not need to eliminate from your diet if you are trying to lose weight is pasta. Just stick with whole grain pasta instead of your typical white pasta. This variety will provide your body with additional fiber, so you will likely find that you feel fuller sooner and you can eat less. And to make the dish even healthier and more filling, add veggies to the mix. As you can see, you don’t need to go without all of your favorite foods if you are on a diet. Just make smarter, healthier choices so you can continue indulging without the guilt and without the weight gain.